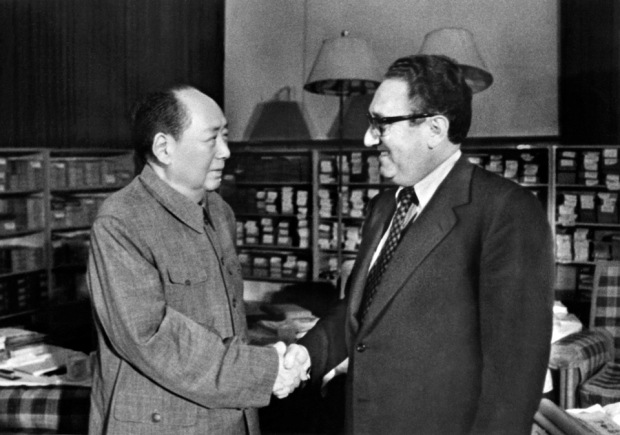 Chinese leader Mao Zedong meeting with U.S. Secretary of State Henry Kissinger in Beijing, on November 24, 1973. This article was first published in the June 9, 2011 issue of The New York Review of Books. The narrative becomes somewhat blurred here, owing to the remarkable confluence of events in China’s quest for a new order. Rebellions, military modernization, transformative education, assertive foreign powers demanding ever fresh “concessions”—all overlapped, compounded by the swift rise of Japan, which between 1894 and 1905 defeated the fleets and the land armies of both China and Russia. With the coming of the New Culture Movement in 1919, the activities of the Third International (the Comintern), and the 1921 founding of the Chinese Communist Party, Kissinger appears somewhat overwhelmed, and the reader might perhaps be wise to skip to what I see as the third of the main variations, where the chapter title “Mao’s Continuous Revolution” signals to the reader that Kissinger is approaching the areas of his analytical expertise as a China-watcher and professional diplomat. In describing the early years of the Communist revolution in China, Kissinger tells us plainly where he stands emotionally. As he phrases it, “at the head of the new dynasty that, in 1949, poured out of the countryside to take over the cities stood a colossus: Mao Zedong.” He shifts the image but not the cosmic idea when he tells us that Mao lived “a lifetime of titanic struggle.” Despite these awesome attributes, Kissinger also admits that the main years of Mao’s power proved that it was “impossible to run a country by ideological exaltation.” The attempt to do so ended by making tens of millions of Chinese lives almost unbearable—one might be tempted to say “inconceivable,” while “millions died to implement the Chairman’s quest for egalitarian virtue” in the famine between 1958 and 1962.
combined historical elements with the same mix of authority and ruthlessness and global sweep as Mao: ferocity in the face of challenge and skillful diplomacy when circumstances prevented his preference for drastic overpowering initiatives. When the US buildup in Vietnam began, Beijing interpreted it in wei qi terms: as another example of American bases surrounding China from Korea, to the Taiwan Strait and now to Indochina…. Hanoi’s leaders were familiar with Sun Tzu’s Art of War and employed its principles to significant effect against both France and the United States. Even before the end of the long Vietnam wars, first with the French seeking to reclaim their colony after World War II, and then with the United States from 1963 to 1975, both Beijing and Hanoi began to realize that the next contest would be between themselves for dominance in Indochina and Southeast Asia. Although much of the Nixon visit to China has been covered by the principals themselves in their published memoirs, the bibliography and notes to On China give helpful leads to many other sources. They enable Kissinger to recall the work of his advance team—and then the President’s February 1972 visit to Mao—in a sustained narrative that neatly blends the personal with the national sides of the story. Kissinger obviously derived immense pleasure from negotiating this China trip and from all his other visits at the highest levels—fifty or more, according to his own calculation—that came afterward. Mao dominated any gathering; Zhou suffused it. Mao’s passion strove to overwhelm opposition; Zhou’s intellect would seek to persuade or outmaneuver it. Mao was sardonic; Zhou penetrating. Mao thought of himself as a philosopher; Zhou saw his role as an administrator or a negotiator. Mao was eager to accelerate history; Zhou was content to exploit its currents. How swiftly, nevertheless, things could change: the Watergate crisis and the resignation of President Nixon on August 8, 1974, led, in Kissinger’s words, “to a collapse of congressional support for an activist foreign policy in the subsequent congressional elections in November 1974.” This was accompanied by an “enfeebling [of] the American capacity to manage the geopolitical challenge,” which in this situation meant above all a policy by which the US would weaken the Soviet build-up on China’s borders. in our country also there is a reactionary group which is opposed to our contact with you. The result was that they got on an airplane and fled abroad…. As for the Soviet Union, they finally went to dig out the corpses, but they didn’t say anything about it. Recent events in North Africa and the Middle East may help to underline Kissinger’s sardonic reflection that “the occupation of the main square of a country’s capital, even when completely peaceful, is also a tactic to demonstrate the impotence of the government, to weaken it, and to tempt it into rash acts, putting it at a disadvantage.” As to the “harsh suppression of the protest,” writes Kissinger, that was “all seen on television.” In fact, I believe it is still accepted by most analysts in the West that the television lights were turned out on the square, and much of the killing took place in darkness—hence the great disparity in reports of what happened where, and when, and of how many fatalities there really were. Such figures are needed if one is to separate random from deliberate use of lethal power. So was Deng Xiaoping a tyrant or a reformer, or an intricate mixture of the two? Some of the most absorbing pages of Kissinger’s book deal with the uses of diplomacy shortly after the Tiananmen crackdown, and the differences in response that were in play. He discusses how President George H.W. Bush sent a personal letter to Deng on June 21, 1989, in which he spelled out the issues concerning sanctions and other steps as he saw them, while at the same time he referred to Deng as a “friend,” despite what had so recently occurred. In the same letter, Bush talked of the United States as a “young country,” especially when contrasted to the “history, culture and tradition” of China. To reinforce some of the themes in the letter concerning the best methods for damage control in the circumstances, on July 1 the President sent Brent Scowcroft (his national security adviser), together with Lawrence Eagleburger (deputy secretary of state), in a military transport plane to meet with Deng and the Chinese premier, Li Peng. In the ensuing discussion seeking some balance between violent suppression and the threat to order, Kissinger observes, “the difficulty was that both sides were right.” The letter and the talks do seem, however, to have led to a reopened dialogue, and in November 1989 Kissinger was invited to Beijing in a private capacity to continue the Bush/Scowcroft overtures. My suggestion would be that you expel him from China and we agree that as a government we will make no political use of him whatsoever. Perhaps we would encourage him to go to some country like Sweden where he would be far away from the US Congress and our press. An arrangement like this could make a deep impression on the American public…. If he says that the American government forced him to confess, it will be worse for everyone than if he did not confess. The importance of releasing him is as a symbol of the self-confidence of China. It was a delicate line to tread, and one that certainly suggested curbing some of Fang’s rights to freedom of expression, as long as it could be done tactfully. In fact, while staying in the embassy, Fang wrote an essay, “The Chinese Amnesia,” published in these pages after his release, deploring the ways that “the Communists’ nefarious record of human rights violations” had been “largely overlooked by the rest of the world.”3 Fang and his wife were finally flown to the UK in an American military plane, and after a spell in Cambridge and Princeton he was subsequently appointed a professor of physics at the University of Arizona. Among other writings, in 1996 he published in these pages an essay (with Perry Link) commenting on the need for “freedom to criticize and dissent” in China,4 and he served for years as both a board member and cochair of the organization Human Rights in China; otherwise he seems to have concentrated mainly on his scholarly work. no longer made any claim to represent a unique revolutionary truth available for export. Instead, they espoused the essentially defensive aim of working toward a world not overtly hostile to their system of governance or territorial integrity and buying time to develop their economy and work out their domestic problems at their own pace. The direct reference to Bismarck’s policies lays a foundation for Kissinger’s sixth and last variation, designed to draw his arguments together, especially those on “balance of power” and the possibilities of meaningful diplomacy. To effect this transition, Kissinger has chosen a classic of pre–World War I diplomacy, known most commonly by its author’s name as the “Crowe Memorandum.” Eyre Crowe was a career official in the British Foreign Office, an omnicompetent tabulator of the European balance of power and the burgeoning arms race, a mine of information on the so-called Western section of the Foreign Office (which he supervised), a master of the statistical skills needed to assemble the relevant information in the vast Foreign Office files, and with a special knowledge of Germany—he was born to a German mother, lived in Germany until he was seventeen, and had married a German woman. England must expect that Germany will surely seek to diminish the power of any rivals, to enhance her own by extending her dominion, to hinder the co-operation of other States, and ultimately to break up and supplant the British Empire. The Crowe Memorandum is a document projecting a kind of ruthless common sense rather than profound complexity. Perhaps for that reason, as Kissinger explains, there are senior military officers and policymakers in both China and the United States today who, more than a century after Crowe, wonder whether his formulations could be adapted to the present time so as to replace early-twentieth-century Germany and England with the choices facing China and the United States today. In its most direct form, this might point to a possible struggle between the two major powers in the Pacific, in a situation with room for only two major protagonists, only one of whom can win. The main riposte to this argument is to seek a richer pattern of alliances in the current century, and to diversify trade in resources, minerals, and cultural relics in a nonthreatening way that can promise wide-scale access to valued resources without major greed and disagreements. that to a foreigner reading our press the British Empire must appear in the light of some huge giant sprawling over the globe, with gouty fingers and toes stretching in every direction, which cannot be approached without eliciting a scream. Both of the memos, Sanderson’s and Crowe’s, were marked “secret.” But they could not both be right. Either Germany had to be stopped in her tracks or England had to lose her paramount global position. No clear decision had been taken when—seven and a half years later—World War I broke out in Europe.